As someone with too many pedals to count, I have to agree with this. It does help to have killer amps too. Right now Bogner & Diezel. Used to be Mesas, H&Ks, Marshalls... actually when I was using pedals I just didn't have money to buy an amp, so it was like pedals into my home stereo input or the mixer of the live sound guy, now those were some nasty times...don't even want to remember. Rarely use outside pedals these days. My live rig is a PODxt powered by stereo Atomic 50w 1x12's. All effects are from the PODxt. Setup time is 5 min, no noise by adding extra cabling, and besides most audience folks wouldn't know the difference. I dont use a lot of whacked effects live so some simple chorus, a few delay settings, some verb is the norm. Even the stomp/comp settings are all I really need most of the time for some extra push. Nice. I'm mostly using a '94 Fender tweed blues deville modded by Andy Fuchs. Dumble sound with Fender twang. Guess a botique amp category is next. 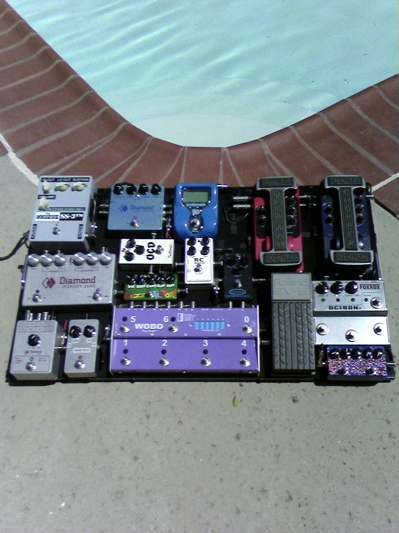 But for now.... more pedals please!! For me the pickup selector is about as far as I go. I really just can't stand having anything in my chain. It's not that I don't like the idea of having them. I have a handful of neat ones, too - including some sweet old Mutron stuff. In the end, I try them for a little while and end up taking them out. Glad to see that the Fuzz Factory is still in action! It is my favourite nasty sound. Proprs for the content mate. but... and I dont mean to be rude... i've only JUST started getting into pedals. Do you need that many? "Need" is a flexible word . . . . .
Again, the AD9 is all that usually makes it. I like to either switch guitars or amps for different sounds and I always sound very amateurish when I try to use effects too much. i have a few peddles but rarely ever seem to use them, when i do they generally set on top the amp if i do use them. but i will throw a few down once in a while! Hey Rob. What's the scoop on the Dynacomp? Can you describe what it does to the sound?